Having suffered a panic attack during a performance, violinist Meredith Stranraer flees to the small town of Paradise where her grandparents live. For some strange reason, they don’t want her around, and their rejection is more than unsettling. It’s downright alarming. Jeremiah Mantle is the local forest ranger. His assignment is to watch the girl in the red cloak from a distance--to protect her as well as the forest. Falling in love, however, is definitely not in his job description. But it becomes increasingly harder to deny their mutual attraction. 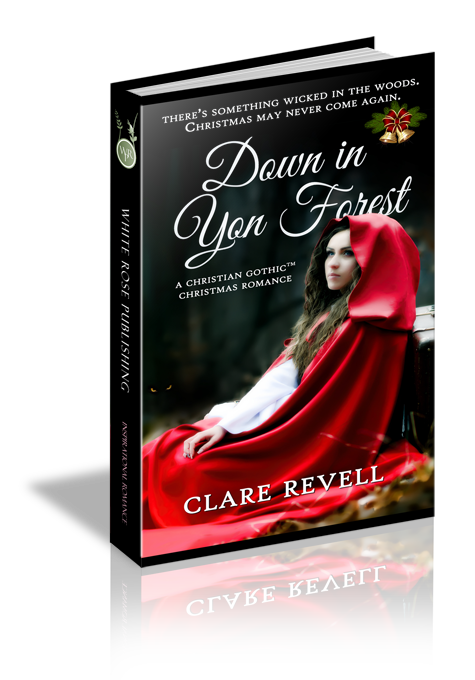 But this Christmas, something wicked waits in the woods, and a dark past seems determined to rip them apart. “Emphasis on the long,” Gramps, the town constable, interjected. “I don’t know…” Truth be told, she’d rather go to the dentist and that was saying something. She’d come here to regain her footing after parting ways with the orchestra. Well, maybe not so much regain her footing as to hide, and Grannie was having none of that. “Your car?” Had she misheard? “That makes me sound superficial.” Grannie huffed. “Tell me again how it works?” Meredith asked quietly as her grandparents snuggled. Meredith managed not to sigh in relief. She might be able to manage that. Crowds and strangers weren’t her strong point. But it was only one evening and a Christmas party to boot. More like acquaintances now. She and Caitlyn been best mates at boarding school, but had hardly seen each other since. A few e-mails now and again, along with birthday and Christmas cards, weren’t exactly conducive to a deep and meaningful friendship, but at least there would be one person at the ball she’d know, even if this random seating idea meant the chances of them sitting together were impossibly small. Perhaps the two of them could sneak off early and catch a film or something instead. Yes, if the dates were boring, they could do the time honored trick of sneaking out to the bathroom one at a time and not coming back. The same way they’d done on numerous occasions at school functions they’d found boorish. Meredith stood and slid her bag diagonally over her body before reaching for her new red cloak. It had been an early Christmas present from her grandparents. They always gave her the same thing, but she found cloaks far more comfortable than any coat or jacket she’d ever owned. This one was knee length and more practical than the full length one she’d had previously. Her fingers ran over the embroidered daisy chain that lay over her heart. “The woods aren’t safe—” Grannie began. “Yes. I have it quite safe.” Meredith bit her lip. For a moment she’d actually considered misplacing it. Sometimes Grannie knew her a little too well. “I’ll see you tomorrow and fill you in on all the details.” She kissed him and headed up the path to the front gate. The lack of Christmas decorations in her grandparents’ house was a shame, but nothing new. Meredith loved Christmas, the lights, trees, carols, going to church, celebrating her Savior’s birth, but Grannie just didn’t see the point of frivolity. And it was so nearly Christmas now. Just a few more days—the app on her phone had been counting down for months and was finally in single figures. Once in the woods, she slowed her pace, despite the cold and falling snow covering the leaf strewn path. Her grandparents were overprotective as usual. It was as if they thought this town was a death trap. Meredith admired the snow covered path. How could anything so pretty be fraught with as much danger as her grandparents seemed to think? Really, the outdoors was one huge cathedral. The trees were pillars, the snow a carpet, and the needles of the evergreens a canopy covering them. All of creation sang the Creator’s praises, from the tiniest seed to the tallest tree. So what if her grandparents didn’t decorate, no store bought decoration could ever look more festive than snow-dusted holly. Meredith hummed a carol to herself as she walked and tried to decide what she could possibly wear tonight. Did she have anything suitable? How formal was this evening going to be? Would a church dress do, or did it need to be full length? Sleeves or no sleeves? She shook her head. She should call Caitlyn and ask her. She reached into the bag under her cloak and pulled out her phone. On second thoughts, she decided to simply wear the new gown her sister, Annabelle, had made for her and sent to Brussels. The one Meredith had never gotten around to wearing to the concert hall. She wondered if there would there be an orchestra tonight. Most likely there would be. She hadn’t played since the incident, leaving the once loved violin untouched in the case in the corner of her room. And there it would stay for a long time to come if she had anything to do about it. The fear it evoked was still too palpable. As the snow fell harder, Meredith’s breath caught as something moved in the woods ahead of her. She gripped the phone tighter as a man with long black hair emerged from the tree line and blocked her path. He stood there for a moment, before stepping to one side. “Afternoon.” His dark gaze lingered on her. The hair on the back of her neck rose. He seemed vaguely familiar. Did she know him? Despite her unease, she nodded politely as she hurried by. She sped up, hearing footfalls behind her, muffled on the snowy path. In her haste, she missed her footing. Her feet slid, and unable to regain her balance, she fell. Arms outstretched, her phone flew forwards. She landed on the cold ground with a thud. Meredith cried out, pain shooting through her palms as the snow-covered rocks bit into them. The owner of the voice wasn’t the dark haired man she’d seen. She took the outstretched hand and let the stranger help her. She gazed up into concerned brown eyes. A lock of brown hair fell over his brow under the peaked cloth cap. High cheek bones, a faint smile, and a firm grip, all took her breath away far more effectively than the actual fall did. Wow. He was definitely not the first bloke she’d seen. “That’s good. Thank you.” She slid it back into the safety of her bag. She flushed. “Can’t make any promises, but I’ll try. Thank you.” She turned, heading down the path to the road, her mind now full of the tall, dark handsome stranger who hadn’t offered his name or asked hers in return. Meredith glanced over her shoulder, wondering if he were still watching her. He stood just inside the tree line. You should ask his name. No, chances are I’ll never see him again. But if you do, you’ll look pretty silly calling him Mr. Man-from-the-forest. She stopped arguing with herself as she reached the main road and branched off to the right. Her hands stung, not just with the small grazes, but with the aftermath of his touch. She’d have to find out who he was. Somehow. Perhaps Grannie would know. After all, she seemed to know everyone in Paradise, by sight if not by name. Jeremiah Mantle watched the young woman walk to the main road, then turn and vanish. He knew all too well who she was, hence not needing to ask her name. He’d been watching her for a while, tasked with protecting her, albeit from a distance. He turned and headed back into the trees. He should have talked more to her, but he hadn’t expected the sudden rush of attraction he’d felt.